Rock ‘n’ Roll musician Jackson Maine (Bradley Cooper) is a fading male icon who’s nearing the end of his glory days. With his alcoholism causing rifts between his half-brother and manager Bobby (Sam Elliott), it’s clear that Jackson’s grown weary of his hectic life. On a random bid to down his next drink, Jackson winds up at a drag bar where finds himself enchanted by a performance from singer-songwriter Ally (Lady Gaga), a waitress struggling to be noticed by the music industry. While hesitant, Ally spends the night with Jackson, where she reveals a hint of her songwriting skills. At Jack’s insistence, she eventually takes up an invitation to come to his next show, shocking herself by jumping on stage and performing in front of a packed crowd. Seemingly overnight, Ally becomes the new ‘it girl’ and Jack’s lover, the couple singing together regularly until she’s offered a professional music contract by record producer Rez Gavron (Rafi Gavron). As Ally’s star begins to rise — she’s groomed into becoming the next big pop star — Jack continues his downward spiral, descending into his addition to alcohol, whilst struggling to be a good, supportive partner to Ally. Together, their love keeps them strong, but when they’re apart, it’s chaotic. Can their relationship survive the trials and tribulations of stardom? Or will the business tear them away from one another? Unless you’ve been living under a rock, you’d know that this story has been re-made countless times before. Working back, the last time we saw it was the Barbra Streisand and Kris Kristofferson headed 1976 version. The most famous adaptation came before that, in 1954, where stars Judy Garland and James Mason headlined the Oscar-nominated flick. We’ve also had a lesser-known 1951 telly movie starring Kathleen Crowley and Conrad Nagel, and another theatrical rendition in 1937, which saw Janet Gaynor and Fredric March play the leads. Finally, What Price Hollywood? started it all in 1932, a film that saw Constance Bennett play an aspiring actress who meets a film director played by Lowell Sherman when she serves him one evening. In addition, we’ve also had a healthy peppering of heavy dramatic narratives that focus on the price of being a celebrity. So, what makes this one so special? When I first saw the trailer for A Star Is Born I was stunned for several reasons. The first was discovering that the movie was directed by actor and star Bradley Cooper, who showed promise as a filmmaker — well, at least in that brief two or so minutes. The second was seeing Lady Gaga as we’ve never seen her before — a stripped down, minimal makeup, daggy clothed version of herself. 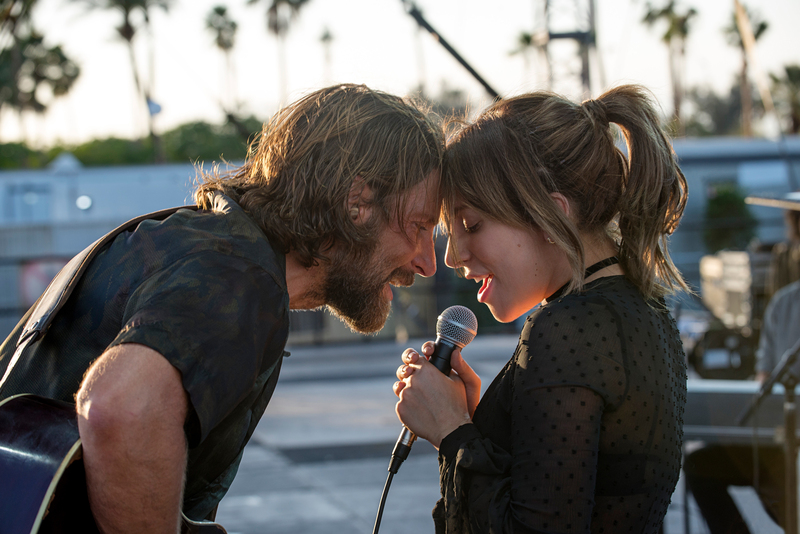 Fortunately, these two welcome surprises kept delivering in the finished film; what Cooper has accomplished here, and the transparency that Lady Gaga has been willing to reveal through her character, is endlessly enjoyable. Sure, the story might be familiar, but it’s been a while since we’ve seen it realized with such chutzpah. The chemistry and collaboration between Bradley Cooper and Lady Gaga feels genuine and authentic. This isn’t about one-upmanship, which Streisand and Garland seemed to relish in their portrayals, this is more about a union of contrasting styles — we already knew that Gaga could belt out a tune, but by the time the film’s over, you’ll be wondering when we’ll be able to catch Cooper at a gig. There’s a true partnership at play here. Gaga has long been very protective of herself as a person, adopting a lavish diva-type persona for appearances, on stage concerts and interviews. Cooper’s career has mostly been a mix of silliness and effortless charm, think The Hangover series (2009-13), interspersed with hard grit à la Burnt (2015), sometimes even a combination of the two, for instance Silver Linings Playbook (2012) — the aforementioned waking Hollywood (and audiences) up to his diversity. 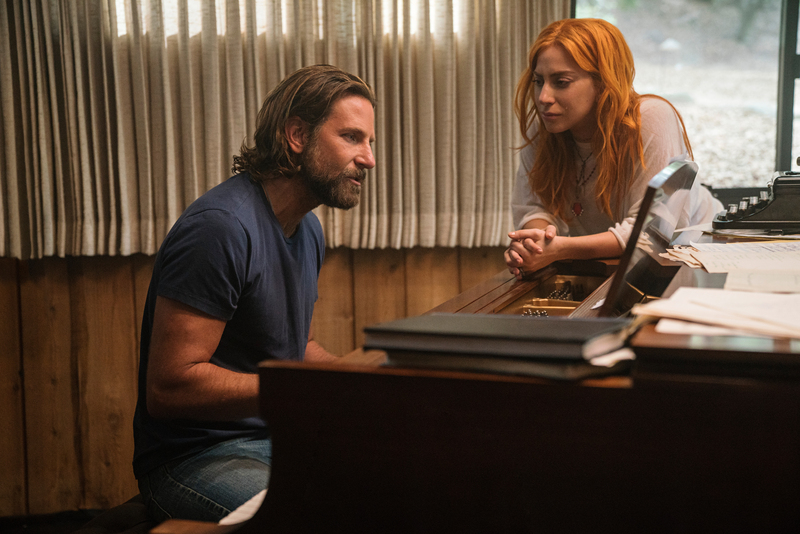 Here, both Cooper and Gaga are nothing short of soul-revealing — yes, they’re playing fictional characters, but it all feels so intensely personal and ultimately, an urgent reminder of believing in the truth within real love, and that it’ll be there no matter what. Supporting them in the stage wings are the likes of Anthony Ramos, Patti Cake$ (2017), who portrays Ally’s BFF Ramon, Rafi Gavron, Nick and Norah’s Infinite Playlist (2008), as Ally’s sometimes sleazy and manipulative music manager Rez, and the ever-dependable Sam Elliott, The Hero (2017), gruff and weary as ever as Jack’s older bro and handler Bobby — this performance likely to nab him a few award noms. Then there’s the left-field surprise cameo of comedian Dave Chappelle, Blue Streak (1999), who shows up at precisely the right moment to literally pick Jack back up as his old friend George ‘Noodles’ Stone, sharing some thoughtful words of wisdom. Cooper’s well-picked screenwriting team, which comprises of Eric Roth, Extremely Loud & Incredibly Close (2011), and Will Fetters, Remember Me (2010), are clearly no strangers to tearjerkers, especially if you’ve seen either of their aforesaid films. The material, of course, could’ve easily descended into pure sap, which was my biggest fear within this story, but the base they’ve provided feels solid, tangible, and in a word, credible, a feat matched by the almost documentary-like feel created by cinematographer Matthew Libatique, Black Swan (2010). Really, I’m only critical of one story-beat in particular, perhaps the most crucial one that motivates the climax of Jack’s character. Considering his trials up to that point, it seemed there could’ve been a more convincing push because Jack’s journey otherwise resolves in a heavy-handed way. It’s not enough to distract from everything before and after it, but it did feel a little overlooked. And finally, of course, there’s the music. 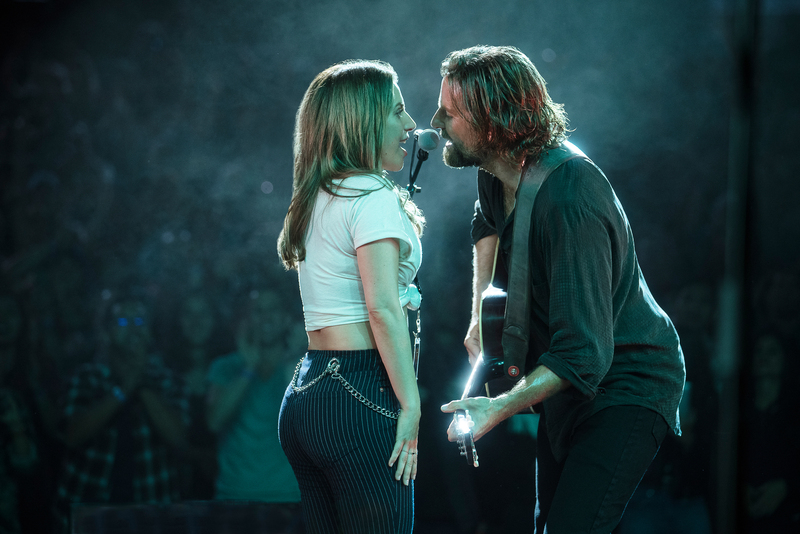 With much of it recorded live within the shoot, the soundtrack features actual collaborations with Bradley Cooper and Lady Gaga, as well as contributions by Lukas Nelson (son of country music legend Willie Nelson). There’s a blend of straight-up rock, such as the ripper opening track ‘Black Eyes,’ subdued folk in Cooper’s ‘Maybe It’s Time,’ big ballads, including the already famous ‘Shallow,’ which is bound to get an Oscar nomination, as well as chilled pop, i.e. Gaga’s ‘Heal Me.’ By deliberate design, the pop-y offerings are the least exciting, with Ally being slowly molded into someone she’s not, but the rest is a really strong mix that will no doubt end up on eager fan’s playlists. To hear these tunes pumping out through the cinema system is an absolute treat, and definitely one of the best sound mixes of the year, thanks to Steven Morrow, La La Land (2016), and Alan Robert Murray, Sicario (2015). With awards season seemingly kicked off early — the likes of First Man (2018) and ‎Steve McQueen’s Widows (2018) already drumming up strong support — A Star Is Born certainly aims high and holds its own. Believe the hype people, as A Star Is Born delivers a powerful and emotionally satisfying journey, at once tragic and triumphant.